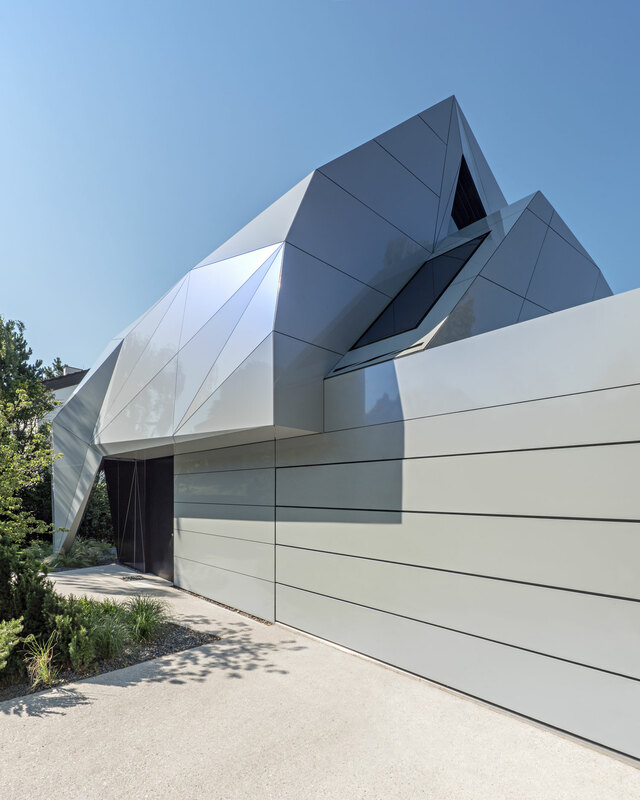 In Vienna, Austria, design duo Andrea Daemon and Andreas Doser of ad2 architekten ZT have designed the impressive CoMED private residence. 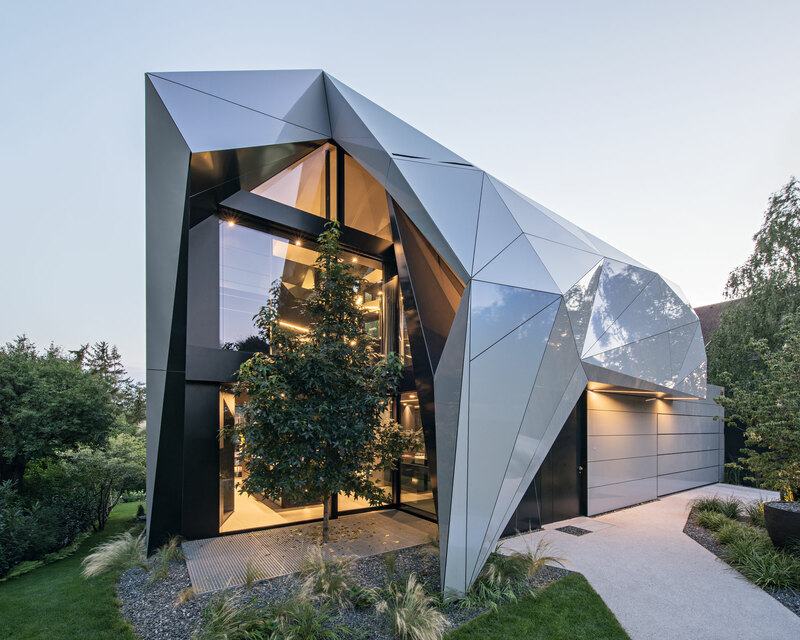 The home is immediately eye-catching as its construction features a series of abstracted geometric shapes. The addition to the home’s unusual angular shape, a prismatic aluminum composite material was used to fully construct the exterior. Alucobond’s Spectra Galaxy Blue was chosen to provide a modern, iridescent alternative to traditional residential building materials. The fully customized home sits within four distinct stories, each of which serve a district function for the family. The ground floor features the home’s communicative spaces, the living and dining area. The two upper floors are reserved for living space, office space and a garden. While the basement level features fitness amenities for the family such as their fitness room and sauna. Interestingly, the strikingly modern façade is unlike any other in the area. Showcasing ad2 architekten’s commitment to changing the way we design homes. From the home’s design to the material’s used, nothing is traditional about this home. 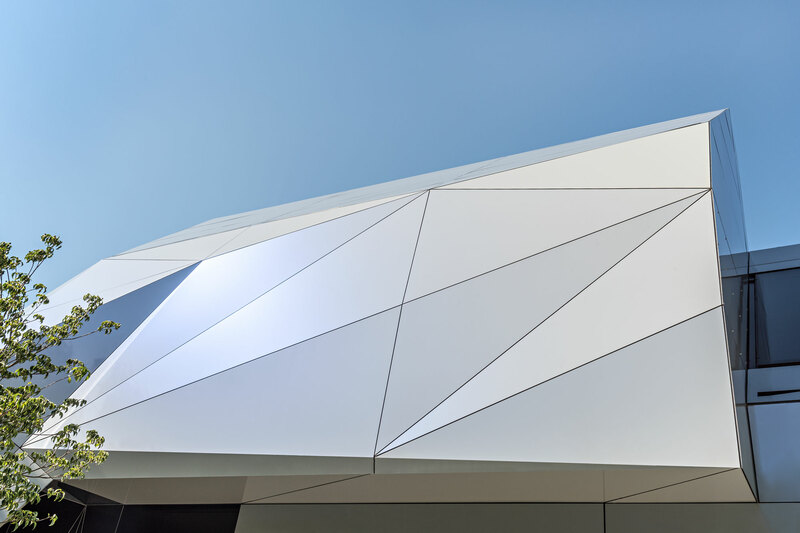 The kaleidoscopic exterior finish offers a unique interplay with light and shadow, reflecting the surrounding foliage and natural light. The material offers a playfulness with the eye, changing color at different angles. The material is further showcased by the architect’s decision to fabricate the panel in various abstracted shapes. The shifting hues are due to a high-performance coating system that was finished with a Lumiflon-based topcoat. When applied to an architectural surface, coatings that utilize Lumiflon FEVE resin technology protect the structure from UV radiation, salt, water, and other elemental deterrents that contribute to coating degradation. The coatings also contain color and gloss retention properties, which helps prevent fading and chalking. Because of the benefits offered by Lumiflon-based coatings, the need to recoat a surface frequently is eliminated, which ultimately helps reduce lifespan costs.